The success of a racing carnival can be judged on various merits – prize money, betting turnover or quality of winners. But from a pure racing perspective, a carnival will be judged on the quality of fields it attracts. England has Royal Ascot, the United States has the Breeders Cup, Hong Kong has International Day and Dubai has World Cup night. Australia, however, is now stuck in limbo between The Championships and Melbourne Cup as Australia’s headline carnival. Melbourne’s carnival has long been the benchmark in Australia due to strong fields it attracts from all corners of the world. It forced the ATC to shake things up and create The Championships, which received a small response from overseas interests. Gordon Lord Byron gave the ATC a big tick when he took out the Group 1 George Ryder Stakes but he is just one of three international raiders across the entire carnival. It’s certainly not enough to call The Championships a legitimate international event, not yet at least. One of the biggest issues facing the ATC is the Dubai World Cup meeting, which is held at the end of March. This year it attracted competitors from Australia, England, Ireland, Germany, France Hong Kong, Japan, the United States, South Africa and Qatar. It was the epitome of an international meeting. It is also in direct competition with The Championships. Quarantine conditions for racehorses in Australia are strict. They require any horse which comes from overseas to stay in quarantine for 14 days at home and then for a further 14 days in an Australian quarantine facility. Because there is only 21 days between the Dubai World Cup and $4million Queen Elizabeth Stakes (2000m), horses cannot run at both meetings. It is even more difficult for sprinters that only have 14 days between World Cup night and the $2.5million T.J Smith Stakes (1200m). Quarantine regulations are in place for the safety and wellbeing of the horses – our number one priority – and are unlikely to change. This leaves the ATC little choice but to reschedule The Championships if they want horses to come straight from Dubai. In order to do this, there must be an approved pre-export quarantine (PEQ) facility in the United Arab Emirates and there currently is not. Horses racing in Dubai must therefore move to an approved quarantine facility in the United Kingdom, Hong Kong, Japan or Singapore before arriving in Australia. International fields should be the aim of future editions of The Championships but to achieve these, the ATC must liaise with Dubai governing bodies to build a PEQ facility capable of meeting the Australian Department of Agriculture’s stringent requirements. In 2010, Melbourne opened the $2m Werribee International Horse Centre, which is now Australia’s premier quarantine facility. It also provides a rough ballpark figure of what would be required in Dubai to build a PEQ facility, a minuscule figure compared to the $18m of prize money on offer across the ten Championships races. Once an approved PEQ facility is established in Dubai, the issue of timing still remains, with 28 days required between runs to meet quarantine requirements. There is, however, leeway for the ATC to manipulate the Sydney carnival dates without impeding on the national calendar. 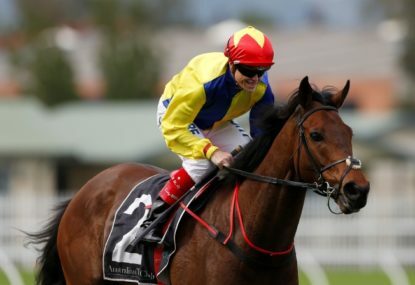 The Queen Elizabeth Stakes and T.J Smith Stakes can be pushed back to the final day of the Sydney Carnival. It would enable horses to enter Sydney’s two biggest races and still race in Dubai. The Championships has shown immense potential following Gordon Lord Byron’s success, but the prize money on offer is still a long way behind what owners can make in Dubai. Rather than competing against another international carnival to draw international fields, more can be done to integrate the two and a PEQ facility in Dubai is a start.